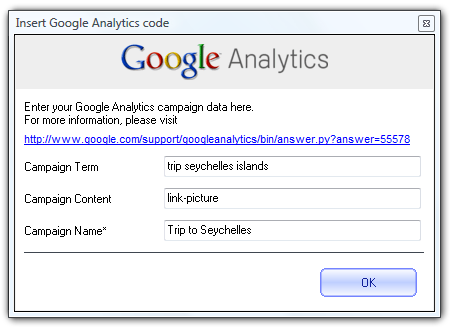 Google Analytics is a free web based analisys tool that can help you measuring the effectiveness of your email campaigns. It is easy to link Google Analytics within the emails you send through Sendblaster, tracking clicks and open rates. Simply follow these steps. This block of code is unique for each website and is provided by Google. It’s necessary in order to generate statistics on the page containing it. Linked text: it’s the link text that the recipient of your email will see. Linked Url: it’s the URL of the landing page your recipient visits when he clicks on the Linked text described above. Campaign source: this variable allows you to separate out different types of email campaigns. We used the word “SendBlaster” so that when you examine statistics, you will see only SendBlaster email campaigns related data. Campaign medium: it’s the advertising medium. Email is the delivery vehicle you’re using, so we suggest to leave the word “email” untouched. Once your URL builder setup is complete, you will simply see a link into the message you’re going to send. 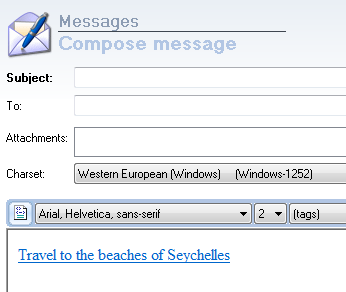 When your recipients click on the link “Travel to the beaches of Seychelles”, their browser will open the landing page you specified in the configuration explained above. 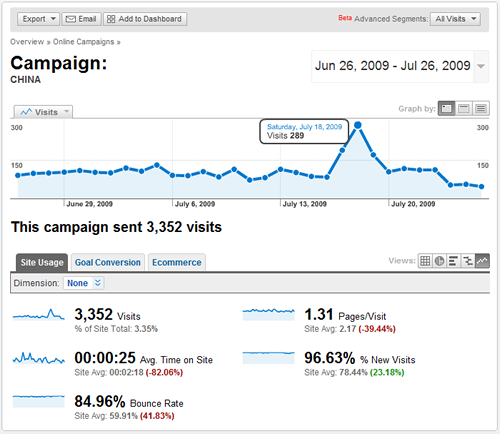 But what’s most interesting to you is to separate out the email generated visits on the overall visitors of that page.